The titles licensed practical nurse (LPN) and licensed vocational nurse (LVN) are used in different parts of North America to describe the same occupation. LPN is used in the majority of Canada and the United States. Licensed vocational nurse is used in California and Texas. The title registered practical nurse (RPN) is used in Ontario. The scope of the work is regulated by the government and LPNs/LVNs may be restricted from doing certain types of work, such IV drips, if they do not have the proper training or certification. The amount of supervision is also determined at the state or provincial level. Some areas require LPNs and LVNs to be directly supervised while in other areas experienced LPNs/LVNs can supervise less experienced or unlicensed staff. To become a licensed practical nurse or licensed vocational nurse, you must complete a one year certificate program. These programs are available at community colleges, vocational schools, and technical schools. Some high schools and hospitals also offer training programs for people interested in entering this career field. The programs typically offer a combination of classroom and clinical training and the coursework includes biology, nursing, and pharmacology to obtain your LPN certification. To obtain a job in the field, you must pass the National Council Licensure Exam (NCLEX-PN). More information about the exam and the requirements for sitting for it can be obtained from the medical board in your area. Advancement in the field is possible with additional education and certification. Commonly, LPNs and LVNs go on to become registered nurses. Others enter supervisory or managerial positions after a few years of on-the-job experience. Detail oriented: The information obtained from patients will be used to diagnose and treat them. It is critical to be thorough when questioning patients and to follow directions and protocols to ensure they get the right care when they need it. Interpersonal skills: You must be able to work with patients and medical staff of all ages, stations, and temperaments. Communication skills: It is critical that you are able to communicate effectively with your coworkers and patients. The care patients receive depends on you being able to relay instructions and information. Stamina: You will be performing physically demanding tasks as well as standing and bending for long periods of time. Nursing care facilities were the largest employer of licensed practicing and licensed vocational nurses. This includes nursing homes and assisted living facilities where the clientele is mostly elderly patients with limited mobility. Hospitals are the second largest employer of LPNs and LVNs. Physician offices, home health care services, and community care facilities are also places that hire nurses with this license. In addition to standing, walking, or bending over for long stretches of time, nurses often have to lift and move patients which require a certain amount of upper body strength. They are also exposed infectious diseases but typically wear protective clothing like gloves and surgical masks to minimize the risk of infection. Dealing with sick patients can be emotionally and physically draining and a certain percentage of workers in this occupation burn out. About 75% of LPNs and LVNs work full time. Working nights, weekends, and holidays is standard especially in hospitals. You may also be required to work overtime. The median salary for this occupation is $40,380. The top and bottom 10% earn $56,010 and $29,680 respectively. Nurses also enjoy additional benefits such as paid vacation, health insurance, and retirement fund contributions. They may also be paid a premium for working overtime or being on-call. 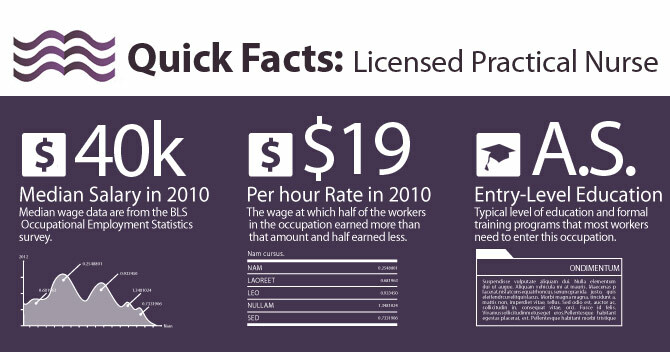 In 2010, over 752,300 people had a job as a LPN or LVN. Job opportunities in this field are expected to grow 22% by 2020. This is faster than average for all occupations. An aging population is the driving force behind the job growth. More people are entering nursing homes and other elderly community care facilities where they often require medical assistance. Another factor in the job growth are hospitals’ gradual shifting of a variety of medical services to outpatient care centers. Job prospects are expected to remain strong in this field as a number of existing LPNs and LVNs retire.